Banjo playing is vibrant and evolving, and Banjo For Dummies discusses not only traditional banjo play but the latest style innovations. 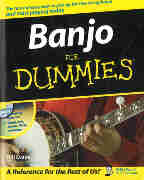 No other book offers such an accessible "point of entry" for the new banjo fan and offers instruction on the various playing styles. Companion CD featues play-along exercises, songs, riffs, chords, and audio and MP3 files.